I honestly never thought I’d dance again. It had been more than 15 years since I’d put my ballet slippers, favorite leotards and worn out jazz shoes away. While I never stopped longing for that blissful feeling of freedom that used to be mine when I danced across a studio floor or stage, I thought for sure that my aging body would never be able to handle the inordinate demands of the classical dance forms again. I just figured my days of sweeping across the floor and leaping through the air with sheer abandon were long over. Then last year, I noticed that a ballroom studio was opening not far from my house. For several months I’d drive by and peer in the windows, trying to muster up the courage to just stop, go in and sign up for classes. Eventually, I did just that and walked through the welcoming doors of Jones Dancesport, the friendly ballroom studio that would soon become my home away from home, a place full of new friends sharing a common passion. Ten months later, I am completely, utterly and obsessively addicted to ballroom dancing. I have been studying intensively with my coach (a champion several times over who I swear is a Brazilian wizard on steroids) for more than five months now. Under his professional guidance I have progressed quicker and grown stronger than I ever anticipated was possible in such a short period of time. I enjoyed every minute of my time on the dance floor and felt very comfortable and confident under my coach’s expert hands. Suffice it to say I don’t know where this journey is going to lead me. When I started this adventure, my objective simply was to become the best dancer I’m capable of becoming, but I don’t want to anticipate or expect anything for fear of setting myself up for disappointment. However, I do intend to work hard and give this my all for as long as I can, to simply open my heart and approach this newfound passion with a beginner’s mind and an undying sense of wonder. All I know is that I just want to live in the moment and enjoy participating in what is indeed the perfect marriage of artform and competitive sport. In finding ballroom dancing I feel as if I’ve come home again, that I’ve been given a second chance in life to once again be my true self – a dancer. No, I may not be able to leap through the air, but my spirit, once again unleashed, is soaring above the clouds. Before Lisa Plummer Savas began her professional career as a writer, editor and blogger, she was a classically trained dancer performing in small groups and local companies in her home town of Los Angeles. When she’s not busy feeding her ballroom addiction, Lisa enjoys hanging out and traveling with her best friend and husband, Chris. 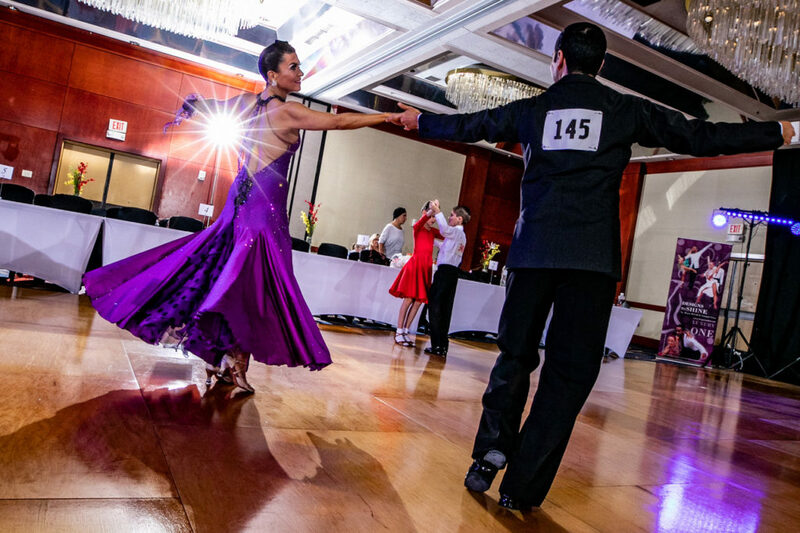 This entry was posted in The Dancing Housewife and tagged ballroom dance, foxtrot, Jones Dancesport Ballroom, Lisa Plummer Savas, pro-am, tango, Viennese waltz, waltz by The Dancing Housewife. Bookmark the permalink.